Homes For Diversity And Inclusivity Part 2: Hide Tall Buildings. Princeton planning and zoning has had unintended exclusionary outcomes, making it hard for local middle-class workers to live in town, and incentivizing car-dependency and traffic. In this series, we explore options for adding more walkable housing in Princeton to enable diversity and inclusivity, while maintaining and enhancing Princeton’s historic charm. You can read Part 1 of the series here. Tall buildings provide opportunities for spacious multi-family homes on a small footprint. This offers environmental benefits, because less land must be cleared to construct the same number of homes, and traffic-management benefits, because a concentration of customers has the potential to support goods and services within walking distance. Nonetheless, a certain section of the Princeton community objects to tall buildings, on the assumption that they do not fit Princeton’s historic character. Tall buildings are not inherently ugly (see for example here), and their critics are frequently people who have the economic means to afford a single-family home. From a pragmatic perspective, however, it may be advantageous to allow for tall buildings in places where most local residents can’t see them. 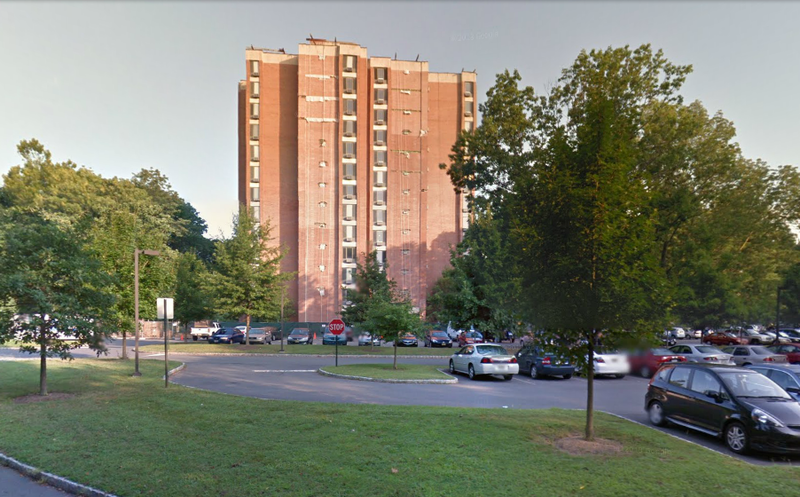 In fact, while the Mayor and Planning Board are currently embroiled in litigation from local residents over the decision to allow a building of up to 5 levels at the former hospital site, Princeton already has much taller buildings hidden out of sight. ‘Holly House’ (pictured above) at Princeton Community Village rises to six above-ground levels. Most Princeton residents are probably unaware that this building exists, as it is tucked away at the back of the Village, quietly providing affordable homes just as it has since its construction in the 1970s. If this building had not been built, many people of moderate incomes, such as this former tenant, would have been denied a home in Princeton. If the same number of homes had been built as low-rise houses, far more green space would have been cleared. This development in Princeton is tidy and orderly, and while it would be better if affordable homes could be located close to downtown, Princeton Community Village stands as a proud demonstration of the commitment of a past generation of Princeton residents to maintaining social diversity in town. Lawrence Apartments, Princeton University graduate housing, on West Drive. (Click to expand, image from Google Maps). 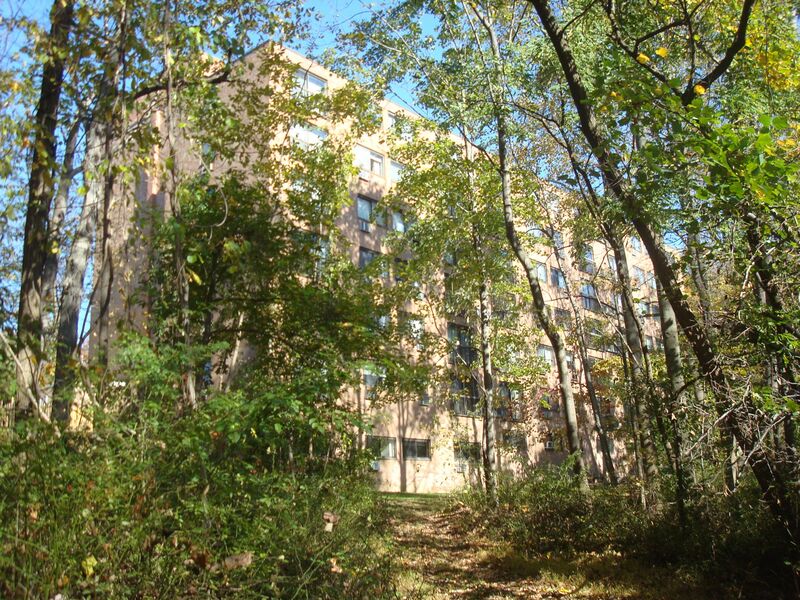 Rising 13 floors at a secluded site off West Drive, Princeton University’s Lawrence Apartments tower provides a large number of homes for graduate students close to campus. Living in a high-rise might not meet everybody’s expectations of the Ivy League, but this building houses a lot of students on not much land. Finding a market-rate apartment in town on a graduate stipend is not much fun. Students who can’t get a place in walkable University housing often live in Plainsboro or Canal Pointe instead, which divides the student community and requires driving into town for classes and labs. A failure to zone housing in town for those in low-paying or trainee positions is a major cause of traffic, and is a regressive imposition on people of limited means. Tall buildings use space more economically, leaving land free for parks and community gardens. The existence of these buildings demonstrates that building higher does not mean overwhelming local schools or infrastructure, and can have minimal impact on the appearance of the town. By contrast, if Princeton built more housing like this, it would open the door to many people who are currently priced out of the local housing market. This would help restore the affordable balance, provide tax ratables to support our amenities, and allow people to live within walking or cycling distance of jobs and in-town businesses. Not everyone wants to live in a tall building, but it’s also true that not everybody wants to live in a single-family home with a 30-minute commute to work in traffic every day. Tall buildings provide choice. But where could we place these tall buildings that would be out of sight, out of mind? The most walkable/bikeable sites that are also relatively secluded are owned by the University and Institute, and include West Drive/Springdale, Lower Alexander Street, and- as we suggested previously- parts of the Butler Apartments site. Hidden behind trees and away from most people in the town, these locations lend themselves to adding taller buildings without impinging on existing neighborhoods. Providing housing for the town is not a primary goal of local academic institutions, but reducing regional traffic by adding walkable housing would benefit everybody. The Princeton Planning Board should encourage local institutions to consider building taller buildings by having the foresight to zone selected sites for buildings of up to 150 feet. Have you ever lived in a high-rise apartment? How was it? What does ‘high-rise’ even mean anyway? 6 floors, 13 floors, 100 floors??? Could Princeton add tall buildings at selected sites without adversely affecting the town? What sites do you think would be most appropriate? Have your say in the comments below! This entry was posted in Affordability, Density, how-to-add-density, Princeton, Smart Growth, Sustainability, Traffic, Zoning and tagged Plainsboro Township New Jersey, Princeton, Princeton University. Bookmark the permalink. 5 Responses to Homes For Diversity And Inclusivity Part 2: Hide Tall Buildings. I think if buildings are well proportioned they can easily be higher-rise than a single story house without being seeming out of place. For instance the mixed use building next to the library is about 5 stories high and I think it frames the Hinds plaza well. In contrast there are plenty of single-family homes that seem over-sized and out of place on their plot. For me thoughtful design is probably more important in determining whether a building fits in its environment than the residential density. When I was a trainee in DC I used to live in a 7th floor apartment. At that time in my life it suited me well and I had a great view! The environmental benefits of higher density go beyond walkability – having fewer outside walls leads to reduced use of resources for heating and cooling – thats one thing I definitely miss every time I get a bill from PSE&G. I lived in Magie Apartments as a child in the late 70s. Having moved from a house with a large garden, it seemed a step down for us, but actually it was a fantastic home. I had my best friends living down the corridor and in the flat above us so could see them whenever I liked, I could catch the bus to school from virtually on our doorstep instead of being driven, and best of all, we had the most amazing unspoilt woodland to roam in, the best tobogganning slope in town next to the apartment, and the lake to look out onto from the moment we woke every day, and to skate on in winter – something I remember vividly as I have not had that experience before or since. Highrises are only horrible if they are unloved and surrounded by other highrises. In the case of Magie and Hibben they were the setting for an idyllic part of my childhood. I would rather have that than cut down all the trees and put up loads of low-rise developments…. oops, they’ve done just that.